Cate recently graduated with an MBBS/BA (Eng/Poli.Sci) from UWA and is now studying towards an MPH. She split her final year elective between a community health placement in the highlands of Guatemala and Paediatric Infectious Disease in New York, in order to explore the globally disparities in healthcare. More recently she was been working on setting up a Global Health Summer School with a group of students at UWA and a health organization in Timor-Leste. The summer school will provide opportunities for medical students to learn about key issues in global health in a group environment, while giving students some exposure to regional health disparities earlier in their medical education than the current final year elective system allows. If medicine is to fulfill her great task, then she must enter the political and social life. An overseas elective is a time to experience medicine in another setting, and it is as much about the setting as it is about the medicine. While gunshot wounds in Johannesburg, and tropical diseases in East Timor, are the often the draw cards when we are planning an elective, it is witnessing the social conditions that lead to those health problems that really change our outlook. Rudolph Virchow was right about many things, but this dictum seems to go unheeded in much of our medical education. Perhaps that is best; there doesn’t seem to be much space in the curriculum for a quick course on East Asian history, Latin American politics or economic development. It does mean, however, that for many of us, our elective becomes a crash course on the political and social life we aren’t taught about in medical school. After some deliberation, I decided on a women’s health elective in Guatemala. It seemed like a good chance to spend some time learning about a single public health issue in more depth, and at the time I was interested in how cervical cancer, a disease so preventable in our own country, could be such a significant killer of women in the developing world. Some quick research led me to believe Guatemala was no different. Once I arrived, however, I discovered that most of the women in that area of Guatemala, Antigua, a wealthy area popular with tourists, were already engaged by cervical cancer screening programs. While the hospital I was working at openly encouraged women to be screened for cervical cancer, there was an issue that no one seemed to be talking about. An issue that inextricably links medicine to the political and social lives of women. Contraception. In the first week I went out on a few visits with the social worker to the villages surrounding Antigua where most of the patients lived. As we walked farther from the edge of town the roads diminished to dirt tracks, the cinder block houses became tin shacks. We spoke mostly to women and many of their stories were similar; they worried when their husbands would next get regular work, whether there would be enough money for food, whether they could continue to afford to send their children to school. It also seemed as if every family had upwards of five or six children, many of them only a year or two apart. The doctors at the hospital had said they did not discuss family planning with the women because it was a cultural issue, and they did not want to alienate the community. Although the hospital was run by a Christian non-profit based in the United States (US), the director stated the practices at the hospital were not guided by religious belief. The doctors and health workers at the hospital would not raise the issue of contraception with patients. If women requested contraception the hospital would refer them to another US-based non-governmental organization (NGO), WINGS, that dealt with family planning amongst other reproductive health issues, and had limited funding and scope. Walking through those tin shacks and dirt lanes family planning seemed much more than a cultural issue, it seemed to be about gender, politics, economics, education, religion and history too. Guatemala has one of the highest fertility rates in Latin America of four children per woman. Amongst Indigenous women that rate is 6.8, and in some rural areas is reported to be as high as 10 per woman. Indeed the Indigenous population, mostly Maya, make up approximately 50% of Guatemala’s population, of which 80% live rurally. As is true almost universally for Indigenous populations, they suffer from significantly poorer health parameters, which can be traced back to a brutal colonial history followed by a 36-year civil war, and the ongoing economic and educational disparities related to this. Given the incredible impact of pregnancy on women’s lives in this part of the world it seemed strange for health organizations to not actively discuss the issue, or to consider it as purely cultural. It seemed like these women were missing out on a basic element of healthcare, but were they really? What does contraceptive use mean to the individual and the society they live in. It was not long before family planning entered the domain of public health. Amid concerns about rapid population growth, international family planning programs in the 1960s and 70s were framed with population policies, with the focus on reaching demographic and fertility targets. In this context some nations adopted coercive population control policies that violated human rights and often targeted sections of the population based on race and socioeconomic status. This sort of practice is completely at odds with the family planning efforts of the majority of governments and public health organizations today. The marked shift in the basis of family planning policy from population control to human rights was clearly demarcated in 1994 by the Program of Action of International Conference on Population and Development in Cairo. Here, 179 countries signed on to a Program of Action that framed family planning as a women’s health issue rather than a purely demographic issue. For the first time, universal access to contraceptives was set as the goal, rather than the population targets set in the past. From this conference onwards the focus has been on autonomy, choice and improving access. With this approach in mind, the benefits of family planning programs in developing countries have been marked. In development terms family planning provides one of the best returns for investment of any public health measure. When women are given access to modern family planning methods they have fewer children and those children go on to be better educated and healthier, suffering significantly less from malnutrition. The most well known cases are perhaps in South East Asia, where countries like Thailand dropped their fertility rate from 6.3 in 1967 to 1.7 in 2003. In this setting the decrease in fertility was associated with an explosion in economic growth, leading to a phenomenon known as the ‘demographic dividend’. This phenomenon occurs in countries with high fertility rates, where an increased investment in family planning results in a significant fertility drop across one generation. As a greater proportion of the population are at working age relative to dependants, there may be more funds to spend on health and education. This raises the ‘human capital’ of the population, as those children who have grown up an environment with increased access to health and education become more economically productive than their predecessors. For the women of the Lago de Atitlan region of Guatemala these global issues are largely esoteric. The inaccessibility of contraception at the local level is made up of a different set of factors, albeit related to these global issues. After talking with these women for a few weeks it seemed that the barriers to contraceptive use could be broadly broken down into economic, educational, cultural, historical and geographical obstacles. In this area of Guatemala, generally only the males worked for a paid wage, which for a campesino (rural labourer) was US$150 per month. Speaking with the campesinos who came to the clinic, it seemed this wage would often need to support families with six or more children and dependant grandparents. An average workday involved 12 hours of backbreaking labour, carrying 60kg sacks of coffee back and forth. Speaking with the women it was clear they worked just as hard: labouring, preparing meals and selling food in the bigger towns. In this environment it seemed there was rarely a free morning, or spare funds, to go and get an injection of depot contraceptive at the clinic in the next town. Contraception would have to be cheaper, or free, and more accessible if they were to use it consistently. Inextricably linked to the economic disadvantage of rural Guatemala was the educational disadvantage. Many families could not afford to send their children to school, which although free, required purchasing shoes, uniforms, books and supplies. The average amount of schooling is 4.28 years per person. Illiteracy rates are amongst the highest in Latin America; 21.8% for men and 39.8% for women. It is estimated that two million children of school age are not attending school. The majority of these are Indigenous girls living in rural areas, the very demographic that go on to experience poor reproductive health and the highest fertility rates. These educational disparities are apparent in every aspect of health and particularly in reproductive health. Myths of contraceptive side effects abound in such an environment. Some I commonly heard were that contraceptives can give you cancer, can cause irreversible infertility, or can cause menstrual blood to collect in the uterus and make a woman sick. Perhaps the most commonly referred to barriers to contraception are culture and religion. In fact, it was the reason the doctors in Antigua gave me for not discussing contraception with their patients. Certainly the Guatemalans are very religious people, 55-60% are Catholic and 40% are Evangelical Christian. There is also a strong machismo culture, as in much of Latin America, and virility is associated with manhood. Culture, however, has proven to be exquisitely sensitive to change when it comes to contraception. In historically strong Catholic countries like Ireland and Italy contraceptive use rates have grown to mirror other developed countries. In 2010, 94% of sexually active adults trying to avoid pregnancy in Ireland had used contraception in the previous year. Similarly, 85% of Catholics in the United States no longer believe that the use of contraception is immoral. I think this signifies that when people are educated and have access to contraception, they are willing to integrate different forms of knowledge into their own belief systems and practices. Attributing the low rate of contraceptive use as religious in origin seems overly simplistic, given members of the same religion in another cultural and economic environment make different decisions. Lastly, nothing can be discussed in relation to Guatemala without mentioning history and geography. The Indigenous Guatemalans bore the brunt of a brutal 36-year civil war, which only ended in 1996. Assumed to have sided with the left wing guerrillas, who supported more populist policies, the Indigenous were targeted by the right wing military government. Some of the towns in the Lago de Atitlan region were the sites of acts of genocide by the government. It goes without saying that public health, and family planning, for these people was not a priority for the Government. Aside from small NGOs that carried out work in the Atitlan region throughout the violence, the health system of the region has been developed from scratch since 1996 and remains grossly underfunded. The Atitlan region remains one of the poorest in a country with one of the most unequal distributions of wealth in the world. Contributing further to the disadvantaged health status of these people is the difficulty of accessing services in larger towns. Seemingly regular natural disasters have severely damaged what little infrastructure there was connecting small mountain villages. Even the shortest of distances can take hours to travel, and poor roads and lack of transport are yet another barrier to delivering effective healthcare. Despite all these barriers to accessing contraception, it seems there is real hope. 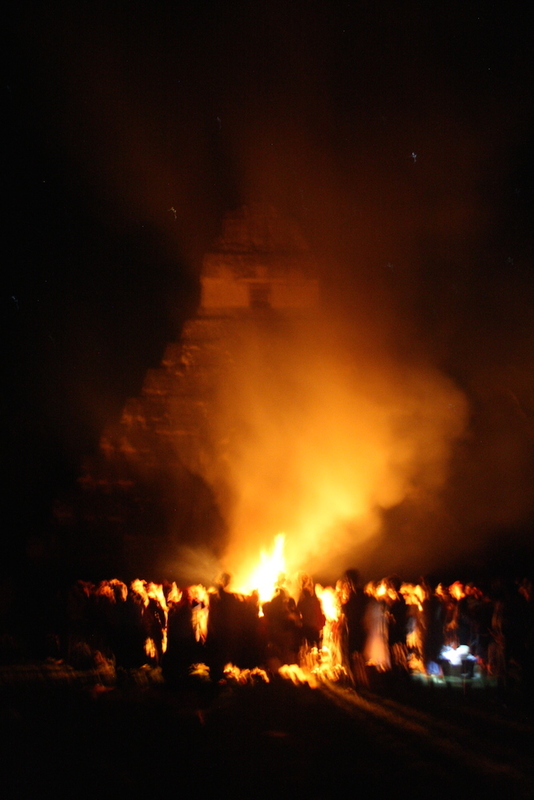 Many of the Guatemalans I met believed the end of the Mayan calendar on winter solstice 2012 would bring change, a new world, and an end to the old world of inequality and injustice. Thinking of the immense change contraception brought to many countries, and the very real possibility that this will soon be available to women in developing countries, I found myself sharing in the optimism. But optimism should never breed complacence, and the struggle to make contraception universally available to women continues. Continued progress towards this goal raises new obstacles. After all, it was only recently in the United States, where contraception has been available since the 1960s, that there was a push to remove the requirement for health insurers to cover contraception from the Affordable Care Act. We cannot afford to forget Virchow’s words now. In order to fulfil our tasks as future medical professionals, we must not forget the political and social life of the world we live in. The Xocomil is the midday wind that crosses Lake Atitlan. The local Mayan people believe the wind carries away sin and the souls of lives lost in the lake. It is famous in the region and is a symbol of change and vitality. Lyle and Andree at Maya Gift for giving me the opportunity to travel to villages as part of my elective. UNICEF. At a glance: Guatemala. 2012; Available from: http://www.unicef.org/infobycountry/guatemala_statistics.html. Metz B. Politics, population and family planning in Guatemala: Ch’orti’ Maya experiences. Human Organization. 2001;60(3). Organization WH, UNICEF, UNFPA, Bank TW. Trends in maternal mortality: 1990 to 2010 2012. Walsh L. Beliefs and Rituals in Traditional Birth Attendant Practice in Guatemala. Journal of Transcultural Nursing. 2006;17(2):148-54. Pfeiffer E. Guatemala. Minnesota Curamericas Guatemala; 2010 [cited 2013]; Available from: www.curamericas.org/our-work/guatemala. Goldin C, Katz L. The Power of the Pill: Oral Contraceptives and Women’s Career and Marriage Decisions. Journal of Political Economy. 2002;110(4):730-70. Santhya K. Changing Family Planning in India: An Overview of Recent Evidence. New Delhi: Population Council, 2003. Greene M, Joshi O, Robles O. By Choice, Not By Chance: Family Planning, Human Rights and Development. New York: 2012. Singh S, Darroch JE. Adding It Up: Costs and Benefits of Contraceptive Services. Estimates for 2012. New York: Guttmacher Institute; 2012 [cited 2013 July 6]; Available from: www.guttmacher.org/pubs/AIU-2012-estimates.pdf. SEARO. Thailand and Family Planning: An Overview. New Delhi: World Health Organization; 2003. Atinc TM. Realizing the Demographic Dividend: Challenges and Opportunities for Ministers of Finance and Development. Word Bank Live2011 Available from: http://live.worldbank.org/realizing-demographic-dividend-challenges-and-opportunities-ministers-finance-and-development. Bloom DE, Canning D, Sevilla J. The Demographic Dividend: A New Perspective on the Economic Consequences of Population Change. RAND Corporation 2003. Family Planning: An Overview. The Bill and Melinda Gates Foundation; 2012; Available from: http://www.gatesfoundation.org/familyplanning/Pages/overview.aspx. Douglas E. USAID Halts Supply of Contraceptives to Marie Stopes in Six African Countries. RH Reality Check. 2008. Gates M. Let’s put birth control back on the agenda: TED; 2012. Simmons A. 7 challenges for 7 billion. ABC News; 2011 [cited July 6 2013]; Available from: www.abc.net.au/news/2011-11-02/7-issues-facing-7-billion-people/3610318. World Population Prospects: The 2010 Revision, Highlights and 2011. Gillis J, Dugger C. UN forecasts 10.1 billion by Century’s End. 2011 [cited 2013 July 6]; Available from: www.nytimes.com/2011/05/04/world/04population.html?_r=0. Edwards J. Education and Poverty in Guatemala. World Bank, 2002. Literacy: Guatemala. 2012 [cited 2013 July 6]; Available from: www.cia.gov/library/publications/the-world-factbook/fields/2103.html. Hallman K, Peracca S. Indigenous Girls in Guatemala: Poverty and Location. In: Lewis M, Lockheed M, editors. Exclusion, Gender and Education: Case Studies from the Developing World. Washington: Centre for Global Development; 2007.
 International Religious Freedom Report: Guatemala. Washington US Department of State; 2006 [cited July 6 2013]; Available from: www.state.gov/j/drl/rls/irf/. McBride O, Morgan K, McGee H. Irish Contraception and Crisis Pregnancy Study. Health Service Executive, 2010. Manz B. Refugees of a Hidden War: The Aftermath of the Counterinsurgency in Guatemala. Albany, New York: State University of New York; 1988.